The team at The Stone Clinic has been repairing rotator cuffs for over twenty years and has progressively improved the techniques. In the early 1990s, Dr. Stone invented one of the first suture anchors designed for rotator cuff repair, the Questis suture anchor, and has been involved in technique design, modifications, and improvements ever since. Due to his confidence in the ability to repair the rotator cuff in a stable fashion, he has been comfortable pushing the rehabilitation program in ways that specifically protect the rotator cuff during the healing period but permit range of motion and strengthening exercises to be performed under the careful guidance of the experienced rehabilitation team at The Stone Clinic. The logic behind stretching and strengthening the inflamed rotator cuff in order to speed healing and functional performance is as follows: The inflamed tissue is characterized by increased fluid between the cells, increased numbers of new blood vessels, and inflammatory type cells. As a result of this inflammatory reaction, new collagen tissue is laid down by the body in an effort to heal the injured tissue. If the shoulder is immobilized during this time, the new collagen is laid down in a disorganized fashion, creating scar. The goal of gentle stretching, strengthening, and anti-inflammatory medication, is to stimulate the cells to lay down collagen along the lines of stress, forming normal strong tendons. The combination of a good warm-up, gentle stretching, strengthening below the limits of pain, icing after working out, and anti-inflammatory medication has been consistently shown to speed recovery time in the strongest possible fashion. Stretching of the shoulder rotator cuff muscles is easily performed both as treatment for inflammation and as a warm-up before activity. Specific stretches are targeted to the desired activity. For example, for skiing, with a ski pole held firmly with one hand at the basket and one hand on the handle, with the arms held out straight, bring the pole from the waist to above the head, repeating the motion slowly to the limits of the range of motion. With the arms above the head, lean the ski pole as far as possible to the left and then to the right. This motion should be repeated with the arms in front of the body, both held out straight and in the flexed position. Many other shoulder stretches are available and most are helpful as long as sharp pain is avoided. Strengthening of the shoulder rotator cuff muscles is best performed by isolating each muscle group and selectively training that muscle. The subscapularis is the anterior stabilizer of the rotator cuff and responsible for internally rotating the shoulder. It is best strengthened by holding a hand weight in front of the body, with the arm flexed to 90º, and rotating the hand to touch the belt. The exercise can be performed while lying on your back with the elbow close to your side and flexed ninetyº. Lift the weight until it is pointing toward the ceiling and then lower it slowly. The supraspinatus is strengthened by holding a light weight (initially 3 - 5 lbs) out straight in front of the body, with the thumbs pointed toward the floor. Slowly elevate the weight to above the head. Stop if pain is produced in any portion of this motion, as the rotator cuff is under maximal stress in this position. The infraspinatus is strengthened by holding the weight in the position of the ski pole just prior to planting the pole. By rotating the arm from the neutral straight ahead position, to the externally rotated (out to the side) position, the infraspinatus and teres minor are strengthened. Again, this exercise can also be performed while lying on your side with the elbow close to your hip, and flexed ninetyº. Rotate the weight until it is pointing toward the ceiling. Shoulder exercises are best performed with relatively light weights and multiple repetitions. This protocol is a guideline only; actual progression will be based on clinical presentation. Early passive range of motion of the glenohumeral joint to prevent capsular adhesions is essential. *This early range of motion is done in a manner that shortens the involved the muscle: i.e., for supraspinatus—avoid adduction past midline and external rotation. DO NOT elevate surgical arm above 70 degrees in any plane for the first 4 weeks post-op. DO NOT lift any objects over 5 pounds with the surgical arm for the first 6 weeks. AVOID EXCESSIVE reaching and external/internal rotation for the first 6 weeks. Ice shoulder 3-5 times (15 minutes each time) per day to control swelling and inflammation. An abduction pillow shoulder sling is used for 4 weeks post-op. Sling wear during sleep is optional depending on comfort. Maintain good upright shoulder girdle posture at all times and especially during sling use. M.D. /nurse follow-up visits at Day 2, Day 14, Month 1, Month 3 and Year 1 post-op. Nurse visit day 2 to change dressing and review home program. scapular pinches every hour, 7) neck stretches for comfort. *It is important to come out of the sling frequently to bend and straighten elbow for 10-15 repetitions each time to minimize arm and hand swelling. Passive range of motion shoulder flexion/scaption 0-60 degrees. Active range of motion elbow flexion and extension. Sling use for 4 weeks. Nurse visit at day 14 for suture removal and check-up. Use of strapping tape for secondary AC compression and support (optional). Soft tissue treatments for associated shoulder and neck musculature for comfort. Passive range of motion shoulder flexion/scaption 0-70 degrees, External rotation to 30 degrees. M.D. visit at Week 4 post-op and will usually be progressed to increase range of motion/ discharge sling. Continue soft tissue mobilization, passive range of motion, gentle mobilizations Gr I/II to increase range of motion. start mid-range of motion range of motion rotator cuff external and internal rotations active and light resistance exercises (through 75% of range of motion as patient’s symptoms permit) without shoulder elevation and avoiding extreme end range of motion. At Week 6: add supine cane exercises. Active range of motion full by week 12. Start a more aggressive rotator cuff program as tolerated. Start progressive resistance exercises with weights as tolerated. Continue to seek full shoulder range of motion in all planes. 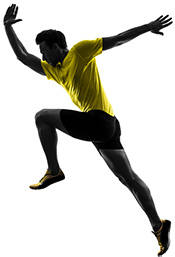 Increase the intensity of strength and functional training for gradual return to activities and sports. Return to specific sports is determined by the physical therapist through functional testing specific to the targeted sport. Initiate slow return to sport training.